Do you live in Estero? Estero is a Village in Lee County, Florida, United States. As of the 2010 census, the CDP population was 18,176. It is the home of Germain Arena, which hosts the home games for the Florida Everblades ECHL ice hockey team. 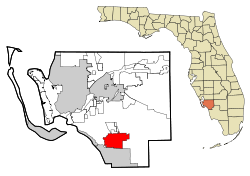 Florida Gulf Coast University is also located just outside of the Estero Planning District.